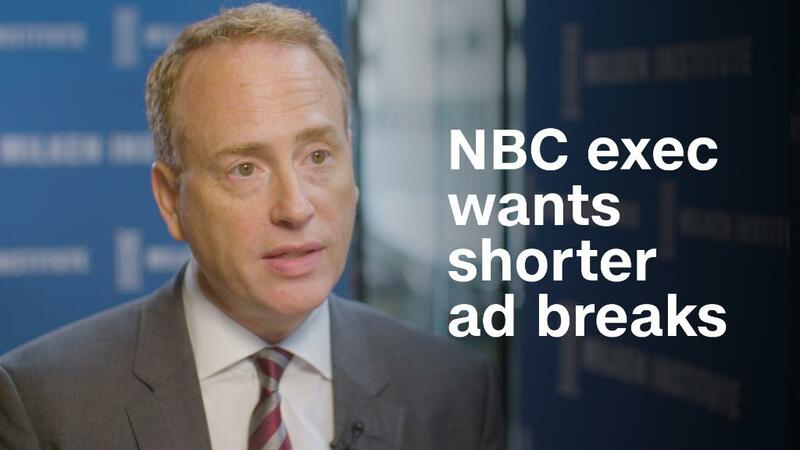 Less is more for the future of broadcast advertising according to NBC Entertainment chairman Bob Greenblatt. "Shorter commercials and shorter pods are going to be better. We have to charge more to the advertiser for that, but it's going to be better for us and better for them in the long run," Greenblatt told CNNMoney's Dylan Byers at the Milken Conference last week. In an effort to attract eyeballs away from ad-free streaming services, the NBC exec wants to shorten the first commercial break in his network's shows from as long as 5 minutes to just 1 minute, with the idea that doing so will keep the viewer engaged. Despite advertisers being charged more for it, he said that commercial break is "more valuable to them because the consumer gets more out of it because they're not barraged with stuff they normally would tune out." The shift in viewer habits is also forcing Greenblatt to redefine a show's success, moving away from ratings to how much money it can make. "All these shows that are on the air also go on digital," he said, noting that they're also seen on Hulu, NBC's website, cable and sold to Netflix for an "extraordinary" amount of money. Greenblatt admitted that NBC's ratings and revenue are dropping, but said he's seeing success in other aspects of the business. "Thirty to 40 percent of viewing of our shows is off the network, so as long as I can follow that viewer to Hulu, which we also own, or other platforms, it's OK with me," he said. "As long as I can track how many of you are doing that and I get some monetization." Greenblatt also predicted two paths for Netflix, which is dealing with rising debt: Either a significant hike in the subscription price -- or an exit. "If you raise the price from $10 or $11 a month to $20 a month, are they going to get to a point where they have so many original shows and choices that the audience just doesn't care, in which case it's a great business," he said. "Or do they sell their company in some significant way to another behemoth and their debit is eradicated? Probably one of those two options will happen."